Manufacturer’s warranties and government guidelines recommend solar panels are cleaned bi-annually as a minimum requirement. Up to 25-50% of your solar panels efficiency is lost when dirt, dust and rainwater residue build up and block out sunlight. 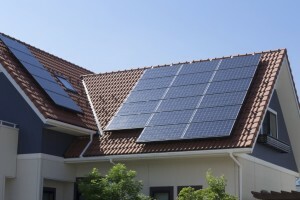 Solar panel cleaning will save you more money in the long run as regular cleaning will maintain your investment, and will help it last longer. As the purified water we use is completely free of detergents it cleans Solar panels without leaving the sticky residue that can damage or make you panels less effective. Solar panels are relatively fragile. You cannot stand, lean, or put much pressure on them. Our telescopic poles with soft brush heads maintain the clean surface needed to keep them effective, whilst not applying too much pressure. We do not use high pressure techniques, because this can damage the solar panels. Please contact us for a quotation on any of the services listed.